Crossborder production sharing brings economic benefit to partner nations. Contrary to the opinions expressed by many, rather than being of an exclusively competitve nature, the integrated economic relationship between the United States, Mexico and Canada can easily be seen as being fundamentally cooperative in nature and, in the balance, beneficial to all three nations. Primarily, U.S. and Mexican, but also Canadian, factory value and supply chains are often linked in such a way that production sharing activities that exist between the countries facilitate and result in the manufacture, distribution and sale of world-class quality goods at competitive prices in both domestic and global markets. Economic integration between the three NAFTA partners can sometimes mean that shutting down production lines in the nation of one of the three economic partner countries can result in the same outcome at manufacturing facilities within the boundaries of the others. Imports into the United States from Mexico and Canada are fundamentally different from those entering the commerce of the U.S. from other nations. A full forty percent of the value of imports from Mexico can be ascribed to material inputs incorporated into end products assembled by Mexican labor, while U.S. content incorporated into products imported from Canada into the United States totals twenty-five percent. This arrangement creates and sustains positions in manufacturing employment, and related supply chain activities, in all three NAFTA participant nations. A textbook example of an industry, among others, that employs an extensive production sharing, or vertical specialization, arrangement within the NAFTA trading bloc is the automotive industry. Passenger vehicles manufactured in North America are truly regional products. In the auto industry, in particular, an increase in regionally produced exports to nations outside of the NAFTA region means an increase in U.S. global export, as well as those originating in Mexico and Canada. This tri-partite production sharing and regional “teamwork” produces net economic gain for all participants. Because the same components, parts and sub-assemblies can cross the borders of each nation involved in a production sharing arrangement several times in the process of arriving at the elaboration of an end product, it is important to limit both tariff and non-tariff barriers to the smooth flow of goods between nations. The signing and implementation of the NAFTA in 1994 was a major step in creating the evironment in which the U.S., Mexico and Canada could successfully compete in trade with other blocks such as the European Union, the South Asian Free Trade Area, the Association of Southeast Asian Nations, as well as low cost producers such as China, Malaysia, Thailand and others. 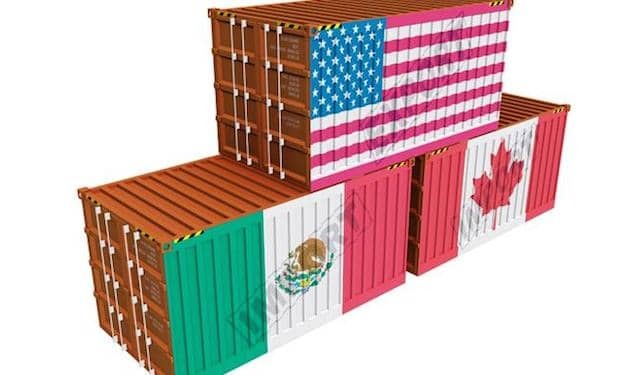 Although many look at Mexico and, to a lesser degree, Canada as economic competitor of the United States, when viewed from a broader perspective, the production sharing dynamic that exists between the three nations benefits each. As a result of working as partners, rather than rivals, products that are made in North America as an economic bloc can be sold successfuly to consumers in all corners of the world. This increases each country’s export revenues, as well as creates and sustains manufacturing and value and supply chain jobs for North American worker.